rocus.com.au at WI. 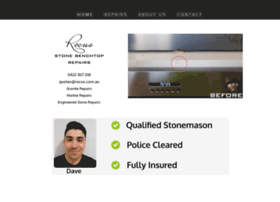 Stone Benchtop Repairs Specialists - Perth W.A. Stone Benchtop Repairs Specialists - Perth W.A. Are you in need of a chip repair? Rocus can help! Stone Benchtop Repairs Specialists. Fully Insured & Qualified Stonemason. Call or Email Today for a Quote.